We searched long and hard for a safe alternative to the formaldehyde-based Brazilian Keratin treatments that you love. They just make your hair frizz-free and shiny. The problem was that formaldehyde-free products just didn’t work. They either gave a poor result or they didn’t last very long. Worse yet, some of them said they were “safe” and “formaldehyde free” but they really weren’t. Though we take extensive measures to reduce the amount of chemicals in our air and the results of all of the air tests in our salon show we are well below the minimum levels for safe exposure, formaldehyde is just not something we prefer to work with. After trying dozens of products, we are thrilled to say we found one that gives great results for most clients and is truly formaldehyde free (brought to you by Bio Ionic and backed by one of the biggest and most reputable names in the cosmetic and beauty industry – L’Oreal). As the product was launched, our stylists worked with Bio Ionic to develop advanced techniques to apply this treatment. These modified instructions have been viewed and used by thousands of stylists around the world. 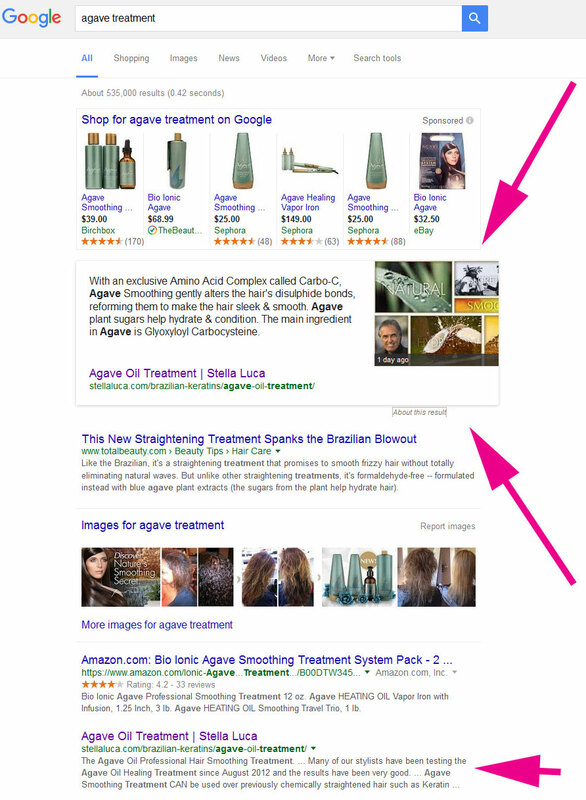 and Google recently recognized us as THE internet authority on Agave Treatments by moving us to “Position Zero”. This is the spot where you see the information BEFORE the top search results. This is what we mean when we say “we’re the experts”. Our stylists have been testing the Agave Oil Healing Treatment since August 2012 and the results have been very good. Your hair can be frizz-free, smooth, shiny, and easy to manage. It’s the first time we can confidently say you can have all of the benefits of a Brazilian Keratin in a safe non-toxic product. At Stella Luca Salons Winter Park, you will find several certified stylists. Many of our stylists have been performing smoothing treatments since they were available in the US in 2007. No, the Agave Oil Hair Treatment is appropriate for every hair type. Of course, if you prefer to have a consultation, one of the stylists at either of our 2 Winter Park locations will be happy to analyze your hair and make sure all of your questions are answered. Alternately, we are available to answer questions regarding this treatment over the phone. Is the Agave Oil Hair Treatment suitable for me? Agave Oil Treatments are perfect for almost everyone regardless of hair type. Agave Smoothing Treatment CAN be used over previously chemically straightened hair such as Keratin Treatments, Thio based straighteners and Sodium Hydroxide Relaxers. It recommended that you not have any perms, relaxers, or straighteners within the 2 weeks. Other than that, you should always consult your doctor before any salon service if you are a pregnant women, a nursing mother, or you have very high sensitivity to chemicals (as with all other salon services like color or perms). What kind of result will I get with this service? As with all smoothing treatments, your original hair type and texture will determine the result you will receive with the Agave Oil Treatment. This depends on certain factors, which include hair length, type, and texture. Typically, the Agave Oil Hair Treatment will take two hours. Once the actual treatment portion of the service is done, your hair will need to process for 20 additional minutes before the treatment product is washed out. Our stylists typically price the Agave service to include the final wash, blowdry, and style so you can see the final result before you leave the salon. If requested, some of our stylists will allow you to wash your hair at home as long as you purchase the Agave support shampoo. If you choose to wash at home, because the treatment product is still in your hair, your hair will appear dull and very straight until you perform this wash. The first wash can be done any time after the 20 minute wait. During the 20 minute wait you can not pin, clip, bind, or tuck your hair and you can not apply any heat to your hair until it is washed. How does the Agave Oil Hair Treatment work? Glyoxyloyl Carbocysteine is very effective in straightening Type 2 European and Hispanic hair. The ease of combing of Type 2 hair increases significantly after the treatment. The hair shine is significantly higher than formaldehyde treated hair. The hair is more resistant to humidity absorption when treated with Glyoxylol Carbocysteine. Do I have to wait to wash my hair like with some other smoothing treatments? After your service is completed, you will only need to allow 20 minutes for the Agave Oil Treatment to continue to process. After 20 minutes, you may wash your hair whenever you like. To ensure proper results, your first wash after the treatment must be with the Agave support shampoo. What aftercare is involved with this process? To avoid reversing the results of your smoothing treatment, the use of proper support shampoos and conditioners is required. Agave brand shampoo, conditioner, and styling oil will compliment the benefits of the service and provide longer-lasting results. Sodium-chloride (salt) in any shampoo, conditioner, or styling product MUST be avoided. What type of shampoo/conditioner should I use? 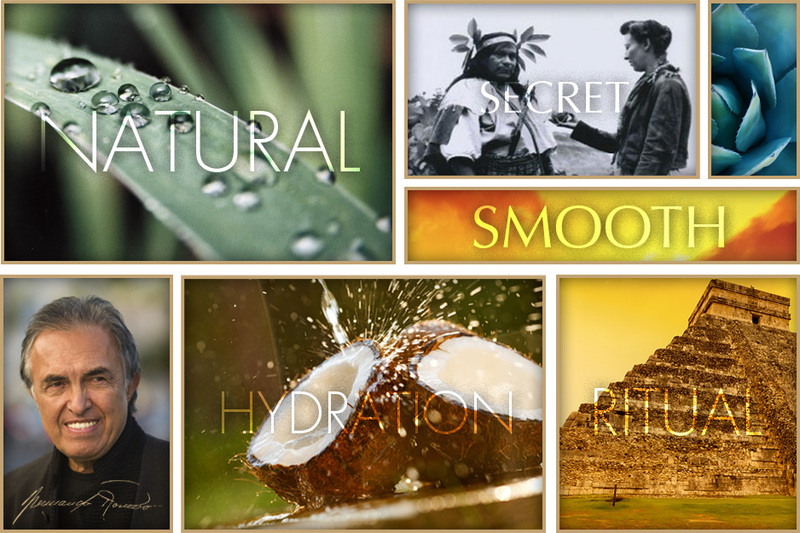 Agave brand products work to provide the best results with this service. How easy will my hair be to handle after having this process done? After having the process done all you will need to do when you wash your hair is a quick blow dry style; that’s pretty much it! You will spend less time than you normally spend in your quest to achieve straight hair. Once dry, you are ready to face the Orlando humidity and, if you do get caught in some rain, you won’t end up with frizz. How often does the treatment need to be applied? The Agave Oil Treatment will last up to 12 weeks depending on your hair type and your follow-up care. Over time the effects will slowly diminish and your hair will return to a natural state. The treatment can be re-done as often as you like. NO! The Agave treatment will help IMPROVE the condition of your hair and protect your hair from humidity and pollutants. Your hair will require less damaging heat-styling than normal. The only possible damage could be from a stylist who applied too much heat. Our stylists are properly trained and certified to be sure that they stay well within the recommended heat range. Your hair should be at least 4-5 inches long before it can be considered for an Agave Oil Treatment. Can I treat my hair the same as before? For most people, it is easier to care for your hair after an Agave Oil Treatment. You will spend less time getting ready and will achieve a better, frizz-free result that will last throughout the day. The correct brushes, cleansing and styling products will be recommended. It is important to follow the recommendations made by your stylist to get the most out of the application. This will be explained during your treatment. Can I swim in a pool and go to the beach? Regularly swimming in salt water or a salt chlorinated pool will reduce the life of your treatment. In moderation, it is fine but we strongly recommend the use of a product to protect your hair and extend the life of your treatment. Soleil Aqua-Seal by Kerastase is the best we’ve found. You should always use the proper hair care products and methods to keep your hair clean and healthy. Your stylist will discuss this during your treatment. Can I have my hair colored after an Agave Oil Treatment? You can have your color done directly AFTER your treatment. If you prefer to have it done before your treatment, it is recommended that you wait 1 week before you receive an Agave Oil Treatment. Can I have this service with hair extensions? Many of our stylists have extensive experience with extensions and some are even educators for some of the extension companies. If you have hair extensions, you should consult with our stylist regarding this treatment. While it is fine for your own hair, it may or may not be appropriate for your extensions. Can this be done on African American or Hispanic Hair? Yes, ethic hair generally responds well to this service. It provides a natural look with soft, smooth, shiny hair. The Agave Oil Treatment is far less damaging than most of the products typically used on ethnic hair. Agave Oil Treatments start from under $225. Many of our stylists offer new client specials on this service. Contact either of our 2 Winter Park salon locations for current pricing and offers. Which of your stylists perform this service? Visit our Smoothing Treatment home page. Scroll to the bottom and select a stylist. Are there reference materials available for this product? What are the ingredients in the Agave Oil Hair Smoothing Treatment? Ingredients: Water (Aqua), Glyoxyloyl Carbocysteine, Glyoxyloyl Keratin Amino Acids, Behentrimonium Methosulfate, Cetearyl Alchohol, Cyclopentasiloxane, Dimethiconol, Dimethiconole Crosspolymer, Cetyl Esters, Glycerin, Isopropyl Palmitate, Agave Tequilana Leaf Extract, Hydrolyzed Wheat Protein PG-Propyl Silanetriol, Glyceryl Stearate, PEG-100 Stearate, Guar Hydroxypropyltimonium Chloride, Fragrance (Parfum), Polyquaternium-10, Butylene Glycol, Sodium Benzonate, Potassium Sorbate, PEG-14M. Is it okay to breath the vapors released by this product? Should you choose to have an Agave Oil Treatment, you should note that, as with most salon products (color, bleach, etc. ), some people are more sensitive than others. Our experience has shown that a well-trained stylist is the most critical factor in maintaining client comfort. Product application technique, along with the use of the proper amount of product and heat, make all the difference. There will always be people, in any industry, who take shortcuts. Stella Luca Salon Winter Park stylists, however, are some of the most experienced, professional hair stylists in Orlando. To further be sure we maintain a comfortable environment, we invested in 2 indoor medical-grade air cleaners for our stylists to use during treatments. The purifiers we selected are movable to be positioned to capture and clean air at the source. Each purifier has 24 lbs. of custom blended carbon designed specifically to ABSORB and REMOVE salon chemicals from the air (including benzene & formaldehyde). In addition to the carbon, each unit contains a HEPA filter, an anti-microbial filter and a dust filter. While there are many units that boost of carbon filtration, they typically only have a bit of carbon sprinkled onto a paper filter. Ours are designed by a company that makes multi-thousand dollar purifiers to provide healthy, clean air in chemical processing plants, plastic factories, hospitals, and other industrial environments. With over 4.7 square miles of absorbent surface, there is NO other portable filter with as much effective carbon. This was a costly investment and we are sure you will not find another salon in Orlando with this equipment. While they do not remove all of the chemicals from the air, they have been shown to be effective at cutting down exposure significantly. Further, we have added fresh air intakes to our air conditioning systems at both of our salons and we have our air conditioning systems set to circulate air in the styling areas of the salon 100% of the time during regular business hours. We also work to be sure we do not complete too many treatments in a single day or too many at once. Demand is high for this product but we want to be sure all of our clients and stylists are comfortable. Yuko Japanese Straightening or a Smoothing Treatment – Which One is Right for Me? Both products work well to provide their intended result. Both treatments need to be done at the hands of a skilled stylist. But which one is right for ME? That really depends on the result you want. We’ve given you a quick comparison below to help you select. If you are still unsure after you read through, Stella Luca stylists have been working with these products for a long time and they can review the benefits and limitations of each. Either way, rest assured that our stylists have more combined experience than any other salon in Winter Park or Orlando when it comes to hair straightening. PROS: It will fade away gradually, meaning that it will eventually leave you with your original natural hair once more. There is no new growth to retouch or growing out stage if you decide not to maintain the look. It takes less salon time and generally costs less than the Yuko system. It leaves the hair with more body than the Yuko (because it does not remove all of the curl) and it can be used on dyed, bleached, heavily highlighted hair. It’s perfect for the client who is mainly looking to add shine, fight frizz, and tame overly curly hair. Hair can be worn straight or with curls. It eliminates 95% of frizz while it maintains a smooth yet silky feel. CONS: It’s temporary. The effect doesn’t last as long as Yuko; about two to four months. It will not perfectly straighten the hair. Smoothing treatments usually remove about 50% of the curl in your hair. Depending on how curly your hair is to begin with, you may still have to flat iron or use a blow dryer to straighten out the remainder of the waves or curls. PROS: It lasts forever, meaning you won’t see any curl or frizz until new hair grows in. Yuko will deliver beautiful, shiny, smooth, frizz-free board-straight hair as it improves the overall health of your locks. Removing almost 100% of the curl from your hair, Yuko can provide much more dramatic results. Clients who have had a lifelong hatred for their unruly, curly hair have literally cried with joy after they saw the end result. Although you will see regrowth in 5 to 6 months, you will appreciate only having to manage the new growth during your morning routine. The treated section of your hair will remain smooth. CONS: It is permanent. As new hair grows in, your new growth will look as it did before your Yuko. To manage this, you will need to have your hair redone in about 6 to 12 months or you will need to flat iron your roots. Alternately, you could reverse the Yuko and add curl back to the treated section. So which one is better, Yuko or a smoothing treatment? It really depends on the result you desire and your lifestyle. If you still have questions regarding either Yuko Japanese straighteners or smoothing treatments, just call to schedule a consultation with one of the stylists at either of our Stella Luca Salons in Winter Park.